You are fascinated by the Angkor temples? With this Angkor Quiz you can now test your knowledge about the temples. The ten questions all revolve around the temples of Angkor, the kings, stories, buildings, divinities and more. Have fun solving the questions! 1. What does "Angkor Wat" mean? 2. When was Angkor Wat built? 3. Under which reign was Angkor Wat built? 4. What is the name of the temple that was used as the scenery for the movies of Tomb Raider? 5. What are the five towers of Angkor Wat supposed to represent? 7. What temple is this photo from? 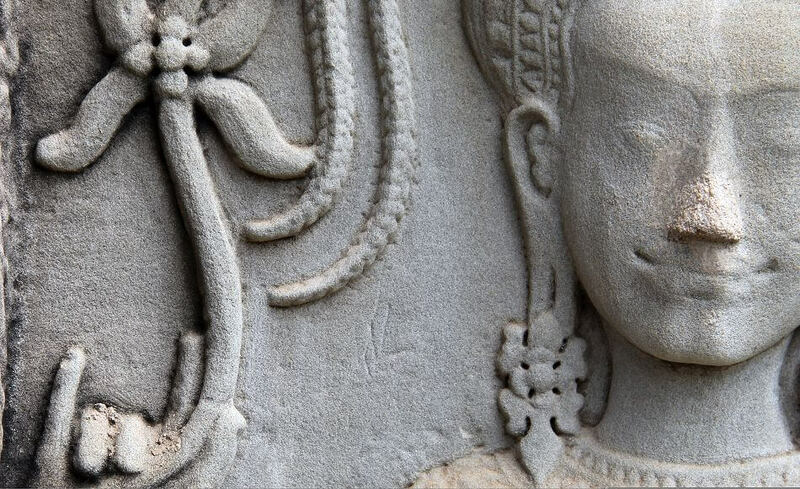 8, How many Apsara figures are there on the walls of Angkor Wat? You may not be an expert, but you still find the temples exciting! And that can be the beginning of a great Angkor passion! You may not be an Angkor expert yet, but you have proven that you already know very well! Great, you already know a lot about Angkor! And with a little practice you will become a real Angkor expert soon! ALL CORRECT - CONGRATULATIONS, YOU ARE AN ANGKOR EXPERT! Congratulations, you are an expert, because you know Angkor like the back of your hand and have answered all your questions correctly! Today I found it needs 1000 reils for toilet in Angkor Wat. A notice is written on a board and the money is taken by a local man. I don’t think it’s fair, even it’s a small money. Maybe I won’t been Angkor again recently, however I would like to let your manage persons know it. It’s bad for Angkor’s worldwide reputations. Hi Susan, thank you for your comment. But unfortunately I cannot help you, because this here is just a Blog and not an official Site by Cambodia. One question: Why do you think it is not fair to take money at a puplic toilet? In countries like Germany which is my homecountry or in Holland you have to pay 1 € and sometimes more.